Mike Cunningham is a Renaissance Man of food production. Under the umbrella of Country Gardens Farm, he presides over a dairy farm, a flock of egg-producing hens, a plant nursery, a pig farm, a herd of meat cattle, a worm farm, and spore-inoculated logs for mushroom growing, as well as classes that cover food growing, preserving, and preparation. I met up with Mike to tour his extensive vegetable area. A customer drove up at the same time. He bought some vegetable seedlings. But then, after some inquiry as to how to use them, he left with a sack of worm castings to improve the fertility of his soil. Through this action, I saw first-hand how Mike is enlightening the larger community about alternatives to synthetic fertilizer. Before touring the farm area, I got acquainted with the farm stand. I grew up in a large city. We kept our doors locked, even when we were home. We were afraid of thieves. I raised small children in an affluent suburb. We never left our children unattended at the bus stop. We were afraid of kidnappers, or in my case, of being labeled an irresponsible parent. But here in Newnan, Georgia, Mike is creating community and building trust amongst neighbors. His customers live nearby. Some folks may drive up to thirty miles to buy his raw milk (for pet consumption), which is hard to find, but most folks live much closer. Back to the farm stand. Nobody staffs the farm stand. It runs on the honor system! Folks click a link in the Country Gardens Farm weekly email and place their order. Mike's wife, Judy, writes up an order ticket. Customers come pick up their order and leave their payment in a metal box. My sense of mushrooms is that they grow at will. Sometimes I find mounds of them in full sunlight at the top of a pile of wood chips. In the forest, I notice them growing out of tree trunks. As Mike brought us over to visit the shiitake mushroom area, I tried to imagine what it would look like. Would there be fallen logs lined up neatly and smothered with wood chips? Or would it be a sci-fi laboratory with mushrooms protruding from vats of porridge-like growing media under special low-light bulbs? As it turns out, Mike grows mushrooms in a living version of the childhood toy, Lincoln Logs. He stacks the wood log-cabin style and drills holes at intervals along the top of each log. He inoculates each hole with mushroom spores. He keeps them consistently moist and waits. Waiting is the hard part. The day I visited, there were only a handful of mushroom "fruit" - the part we eat. But some days they all fruit at once. Mike finds it difficult to keep his customers regularly supplied with shiitakes. It's either glut or famine. I am fairly confident that Mike will experiment with alternative growing methods, seeking more consistency in his mushroom flushes. I say this, because he tweaks all of his farm processes. He is the quintessence of the resourceful farmer. He has a demonstration area set up to showcase the straw bale method. Next to it, visitors can see how the square foot gardening method works. As we toured the property, we saw a freezer strapped to a trailer. It keeps meat cold during drives over to the farmer's markets. Mike brought us over to the seed-sprouting greenhouse to show us a germination cabinet he had built. He took an old rack, put some boards and insulation around it, positioned a galvanized washtub on the bottom shelf, and outfitted it with a water heater element. And voila! A seed sauna for the cold winter months. Mike is a natural when it comes to re-engineering. Mike has chosen to get certified under the Certified Naturally Grown label. He farms using organic methods. For example, he holds the mighty weeds at bay with a thick layer of wood chips and leaves. The weeds that are victorious over the mulch are then pulled by hand. No herbicides are used. Mike follows a no-till/low-till policy. Once a bed is established, he leaves all roots in place, even after harvesting annual plants. The roots help the soil retain the microbial activity that promotes the uptake of nutrients to the plants. Mike uses worm castings for his seedlings and at transplant time, which also increases the nutrients available for the plants. He prunes his tomatoes to increase airflow in and around the leaves. This reduces disease. He also intercrops the tomatoes with leafy greens and herbs. In May, there is still a line of spinach nestled along a line of tomatoes. This might thwart bugs that don't like spinach or those that hate basil. For those familiar with organic practices, this may be run-of-the-mill stuff. But Mike, is making a living at it. In addition to the farm stand, Mike brings produce, meat, eggs, and milk to 3 farmers markets in the Atlanta area. 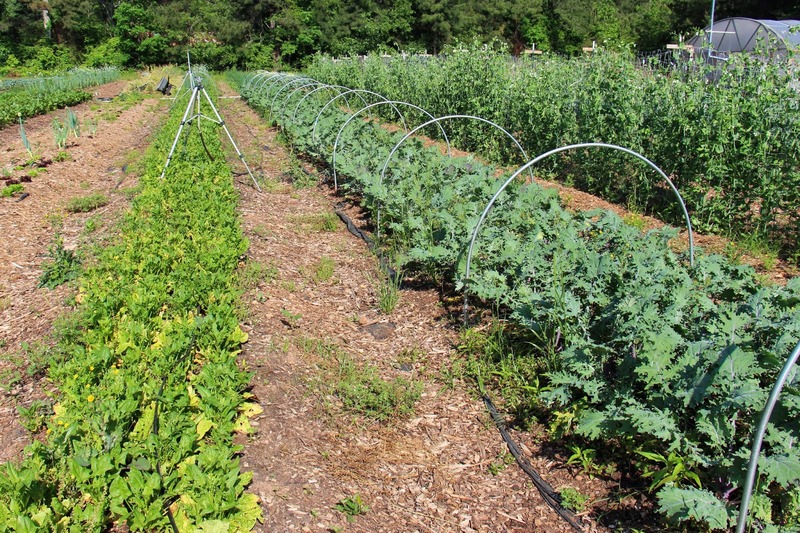 His CSA (Community Supported Agrigulture) has 65 members, which brings in about $50,000/year. Mike and his wife bring in, on average, $300/week just from the vegetables. One son sells 350 gallons of raw milk a week at $8/gallon, milking 20 cows. He also has about 300 laying hens and they sell about 100 dozen eggs each week at $6/dozen. They sell about 20 beeves/year, which brings in about $30,000-$40,000. These figures represent gross income and there are significant costs associated with these numbers. I ask Mike how this compares to the economics of conventional farming. He tells me that it takes more time to harvest by hand rather than with industrial-style mechanization. Overall, following organic methods costs more. But, Mike is also able to charge more for the food he produces. I would have loved to see the worm casting farm, the raw milk dairy, the grass-fed cattle, the free range chickens pastures, and the hogs, but Mike is a very busy Renaissance Man of food production, and I didn't want to take any more of his time. 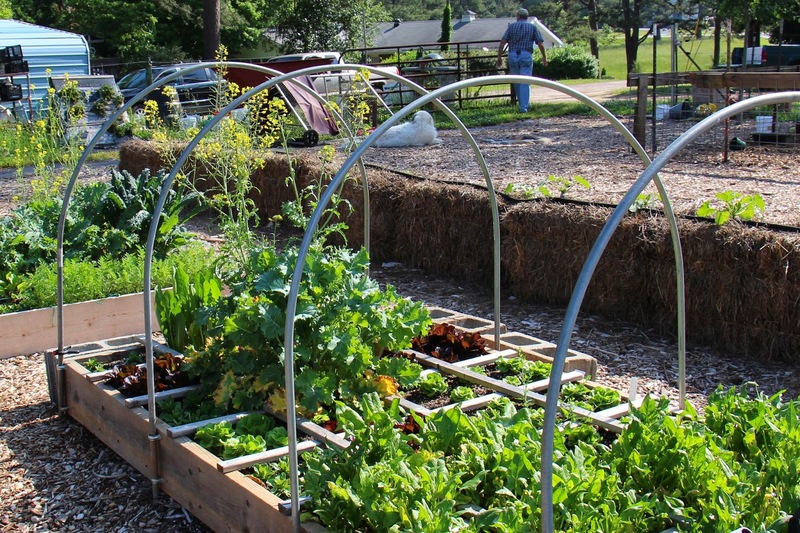 Country Gardens Farm Stand, Newnan. Place orders ahead of time.